I have written about many aspects of the entrepreneurial journey via this blog – the metaphor, the mystery and the back-story to name a few. But I have not written about one of the most important, critical and soulfully satisfying parts of the ride. It is what I refer to as the “Hobby Phase”. If you would have told me that Keyhubs was just a hobby back when it was, I would have been slightly offended. I fully intended it to be a real company. But, in retrospect, the reality is that it was “just” a hobby for the first four years of its existence. While the idea for Keyhubs was planted in 2006, it wasn’t until a full year later that I did anything about it. And it took another year before our efforts translated into an actual product. Even then, Keyhubs was still “just” a hobby. And it hobbled along this way for another year and a half or so, before I made the leap. The point here is that the “hobby phase” was a critical part of the journey. It allowed me to dabble, explore and test ideas with very low risk and investment. Things moved extremely slowly. Believe me, I wanted it to move faster, but there was only so much I could do in my free time. I spent about 1-5 hours per week “watering”, “weeding” and “fertilizing”, not knowing if or when this little seedling would bear fruit. That said, taking it slow gave me time for the idea to germinate, incubate and percolate, in my own mind, and in the minds of our potential customers. While nothing much happened above the surface, underground, roots deepened, building a stronger foundation for the long days ahead. The hobby phase also tested my staying power. How serious was I about this idea? How passionate was I? Did I love it enough to stick with it regardless of how much money it would bring in? Most would agree that hobbies are about doing things for the love of doing them, yet the phrase “just a hobby” does a huge disservice to what I would consider one of the most potent methods for launching something of meaning and lasting value. Hobbies are channels for creative self-expression, personal development and purpose in action. These are the very building blocks of true motivation and the forerunners of successful, sustainable and transformative ventures. See any common threads? These examples embody to me what I see as a growing and especially fulfilling genre of entrepreneurship – what I would call heart-centered entrepreneurship – entrepreneurs that grow something out of pure love and creativity – through passion, purpose, persistence and patience. In essence, by nurturing a hobby. Through it all, these entrepreneurs obtain a kind of profit that is priceless beyond measure. Based on these inspiring stories and our own experience, we continue to operate with a hobby point of view. Every new innovation that we create starts as a hobby. We currently have several hobbies in our pipeline that we expect will find expression in the form of new innovations – two, five maybe even ten years from now. We are in no hurry. I wonder how many entrepreneurs and investors side-step the critical hobby phase in favor of quick returns, only to short-change their long-term viability? I wonder how many people talk themselves out of following their passions because it is “just a hobby”? Keyhubs wouldn’t be where it is today if it were not for those four years of tinkering, reflecting and moving at turtle’s pace. We want to enjoy the process, not just reach a destination. I want to spend my days absolutely loving what I do each and every day. It is from this place of love, heart-felt love for the work we do, that true magic happens. What do you love doing? What are you hobbifying? It just might change the world. Vikas Narula (@NarulaTweets) is Creator and Co-Founder of Keyhubs (@Keyhubs) – a software and services company specializing in workplace social analytics. He is also Founder of Neighborhood Forest – a social venture dedicated to giving free trees to kids every Earth Day. Entrepreneurship and Spirituality – An Unlikely Combination? As always … very insightful and well written. Should be required reading for anyone who wants to be an entrepreneur. Thank you Darshan! Really appreciate the feedback! Thank you Jeff! Glad you enjoyed it. I loved, loved this post!! I’ve been stuck in the belief that my hobbies are hopeless at turning into profitable ventures, this post is forcing me to rethink. The videos you posted brought tears to my eyes. So touching and so inspiring. Thank you Ananda. Hobbies are highly underrated. Glad you enjoyed the videos – aren’t they amazing? Looking forward to seeing your hobbies blossom! As usual, I appreciate where you’re coming from, the idea seeds that you plant, the love you share and more. Keep this thread of idea sharing. Thank you so much Wendy! Great post Vikas! Been having conversations about mindful pace with other leaders in the Wisdompreneurs movement. There are some that pushing us to move faster than we have been. And yet, I personally value “majestic” and “lasting” more than fast. This post feels really supportive of that. I agree – being in a chronic rush never feels good – we can learn so much from nature. Really appreciate your feedback and support. 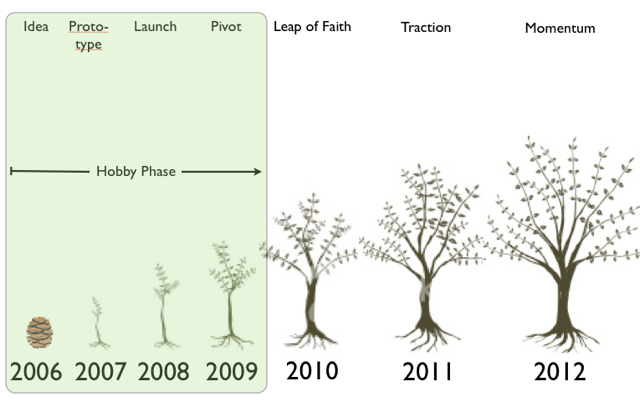 I really love reading your posts—especially when you mention the words “back-story, metaphor and mystery” 🙂 I felt encouraged by the idea of not minding if it takes years to develop a venture you’re passionate about, and loved the idea that slow growth allows for roots to grow deeper. Right now I’m growing my skill in fiction writing by writing a novel on the side while continuing my usual business of writing nonfiction for publication. Sometimes the learning curve seems so incredibly slow–yet it’s still so much fun and rewarding to learn new skills that I keep at it. Thanks for the encouragement. So, nice to hear from you! Thank you for reading and posting your thoughts. Yes, keep nurturing that love and passion. It will bear tasty fruit in due time. Sounds like you are already enjoying the fruits of your labor of love.